Elkin puzzled by ultimatum to media on cabinet matters; security source reveals Bennett had access to info but didn't pick it up. A last minute demand by Education Minister Naftali Bennett's Jewish Home party will need a solution before the coalition can be expanded on Wednesday, with the addition of incoming Defense Minister Avigdor Liberman's Yisrael Beytenu. Following a report on Operation Protective Edge and the Second Lebanon War showing key intelligence was not shared with members of the Security Cabinet, Bennett demanded that Prime Minister Binyamin Netanyahu fix the flaws. He called to appoint a military secretary to each minister to give them security updates, to increase trips to military zones and give easier access to sensitive intelligence information for cabinet ministers. 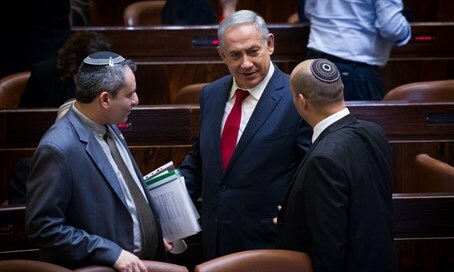 Bennett also issued an ultimatum, saying that if the demands are not met Jewish Home will not vote in favor of Yisrael Beytenu joining the government. Immigration Minister Ze'ev Elkin (Likud) responded to the demands on Wednesday morning, telling Army Radio "there's a saga here that's very very strange in my eyes. Jewish Home members came to me and said 'let's approach Liberman (to bring him in), it's very, very important.'" "I don't remember a single time when matters of the cabinet's functioning were matters for coalition negotiations in the media," he said, criticizing how Bennett made the demands to the press. "There are things that even if they want to change and fix - you talk about them with the Prime Minister and bring them up for discussion." "We prepared intel, Bennett didn't pick it up"
Israel National Security Council chief Ya'akov Nagel was also critical of the demand, telling Channel 2 that "ahead of every cabinet hearing, every minister who wants to can prepare for the discussion." "Every minister can receive all the relevant information and receive preparation for the cabinet from members of the National Security Council. Every minister who wanted to - and there were ministers who wanted to - received all the relevant material ahead of cabinet discussions." His statement rebuffs Bennett's demand for a military secretary and easier access to intelligence information, as he noted that only a lack of initiative of the ministers prevented them from receiving the information. Security sources cited by Channel 2 noted that during the negotiations ahead of the Iran nuclear deal several cabinet meetings were held, discussing Israel's response to the nuclear threat. Bennett asked to deepen his understanding of the matter ahead of the cabinet meetings, and the security sources prepared intelligence materials for him four times. According to the sources, he did not arrive all four times in order to pick up the materials that they prepared for him. In response to the revelation, Jewish Home issued a statement which did not deny the claims, but rather said, "if the Prime Minister fought Hamas as he fought Jewish Home, our security situation would be better." "It would be better if he focused on a solution to the cabinet failings instead of sending respected security sources on political missions."